The rusty structure on the right has carried trains across the Calapooia River south of Tangent for 111 years. On my way back from Shedd on Thursday, I was glad to see that my favorite railroad bridge has not yet been replaced. I like all bridges, but this one especially because it shows that a simple design properly built can do a hard job for more than a hundred years. This bridge is on the main line of the Union Pacific, about two and a half miles south of Tangent. Its cross piece on the south side gives the year of its construction, 1906. Rooting around online, I came across Bridgehunter.com, where a contribution added in 2010 by Mike Goff informed me that this is a “Warren through truss bridge” built for the Southern Pacific by the American Bridge Co. of New York. The bridge, 300 feet in total length, is a “standard six-panel Warren truss” with riveted connections. I used to wonder how something that old could handle the loads of modern freights. The answer I got was that bridges built to hold up the massive steam locomotives of that era can easily handle modern equipment. By the time that bridge was built, the Southern Pacific had taken over the Oregon & California Railroad, which figured in a completely unrelated little story I also stumbled across in my online wandering. 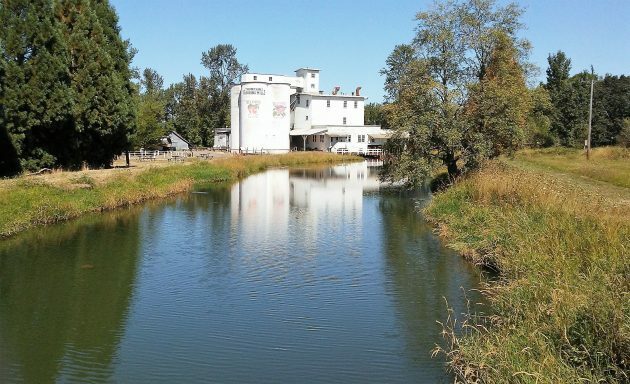 It was reported by the Oregon Board of Railroad Commissioners in its biennial report for 1889. The story was that on Aug 10, 1887, the O&C charged B.A. Witzell $16 for shipping 10 tons of wheat from Tangent to Albany, a distance of seven miles. Witzell thought he was being gouged and lodged a complaint. Two weeks later, the two-man railroad commission met at the Revere House in Albany, heard the case and decided that a reasonable charge would have been $8, so the railroad owed Mr. Witzell $8 and was ordered to pay him before Sept. 26. Talk about justice that is swift. My drive in the country also took me past the always picturesque Thompson’s Mills State Park east of Shedd. Thanks Hasso. Love this kind of history. Since you’re a member of the Albany Rifle and Pistol Club, Hasso, perhaps you would like to call the attention of your readers to http://www.repeal719.com, which provides information about the campaign to place SB719 on the ballot for referendum and repeal. 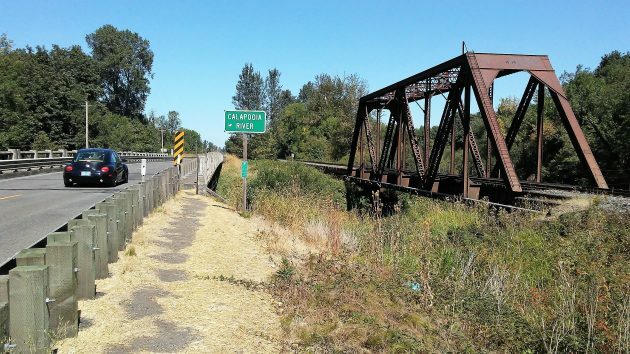 While having the through-truss around is excellent, your article did not mention that the wooden trestle over the slough just to the north has been completely destroyed and replaced with a concrete slab in the last few years.